To demonstrate the importance of water budgeting in Ontario this manual provides a practical, scientifically defensible approach that practitioners can use to address a wide range of water management issues. The development of a water budget is a fundamental step for predicting the future impacts to our water resources. By quantifying each component of the hydrologic cycle, including key processes, pathways and water uses, the water budget can be used to gain an understanding of watershed trends and the stresses to groundwater and surface water. Water budgeting provides a technically sound methodology for evaluating and managing the quantity of existing and future sources of water within a watershed. 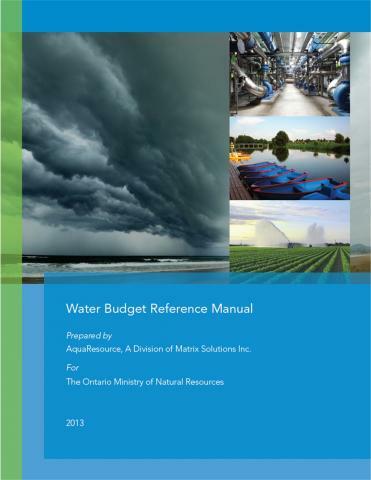 The reference manual specifically discusses: Water management rationale and legislative context for Ontario; The hydrologic foundation for understanding watershed processes; Information sources and data quality considerations; and Methodologies for water budget activities. A water budget is a means to assess and account for the movement of water through the hydrologic cycle. By quantifying each component of the cycle, including key processes, pathways and uses, we gain an understanding of watershed trends and the stresses to groundwater and surface water.